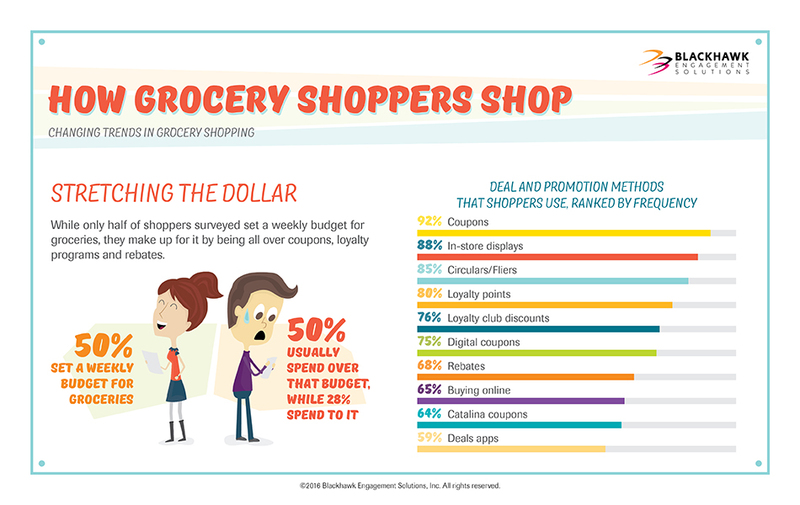 PR Newswire, Lewisville, TX – February 9, 2016 – American grocery shoppers are strapped for time yet willing to work for the very best value, according to new research from Blackhawk Engagement Solutions. 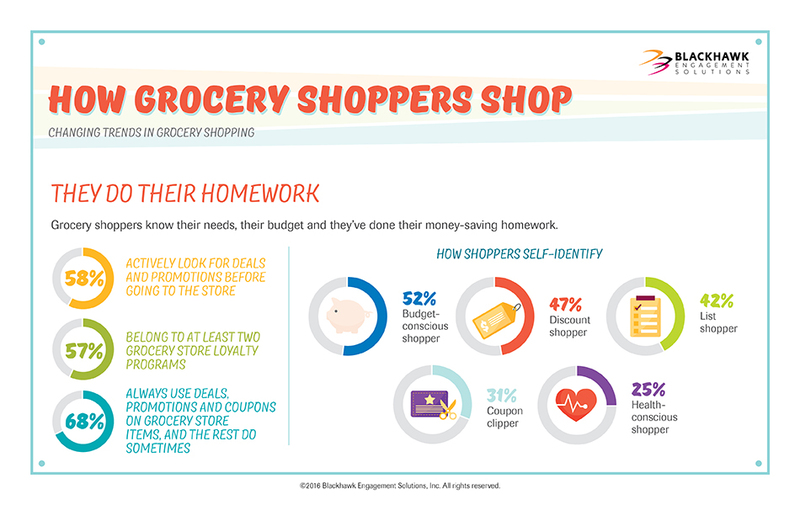 The new shopper data shows that consumers are well prepared, and arrive at the grocery store knowing exactly what they’re going to buy, and most importantly, why (value). 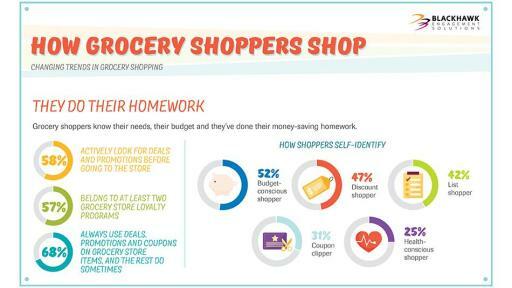 “Brands can no longer take grocery customers for granted. Price sensitivity, customer time deficiency, and instant access to promotions and product information are putting greater pressure on retail and product companies to shift with consumer demands,” said Rodney Mason, GVP of Marketing at Blackhawk Engagement Solutions, an international incentives and engagement company. 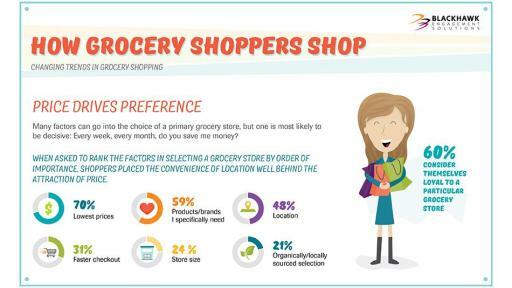 It’s about the bottom line: When asked to rank the factors in selecting a grocery store by order of importance, shoppers placed the convenience of location behind the attraction of price: 70 percent said price was the leading factor, 59 percent said products/brands I specifically need, 48 percent said store location and 31 percent said faster checkout. 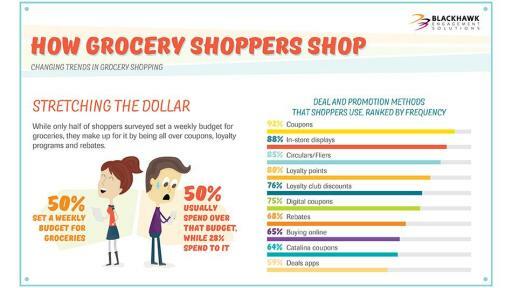 Additionally, 60 percent of shoppers report being loyal to a particular grocery store. 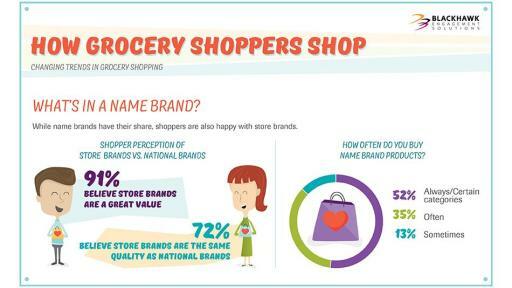 Consumers aren’t always brand loyal: Ninety one percent of shoppers believe store brands are a great value, and 72 percent believe store brands are the same quality as national brands. 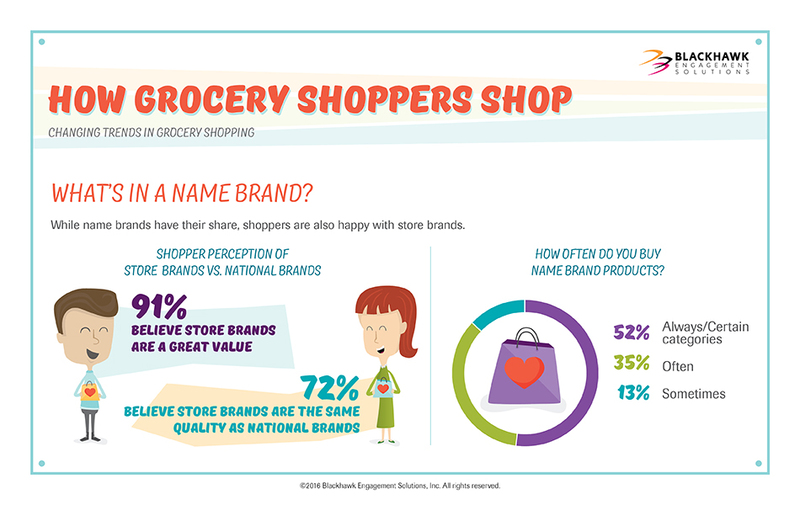 Only half (52 percent) of shoppers report buying brand-name products always or in certain categories. Consumers prefer larger values from rebates: Shoppers don’t mind jumping through a hoop for bigger savings. By a large margin, the majority prefer richer rebate rewards over instant discounts for single-item purchases across all grocery store departments, including gift cards, cooking and baking supplies, cleaning supplies, pet supplies, baby supplies, paper products, meat and deli items and more. Shoppers embrace grocery store apps, not third-party shopping apps: Consumers are becoming increasingly more comfortable using apps for grocery shopping; the top used apps are: Amazon (71 percent), grocery store apps (28 percent), Walmart (26 percent) and Target (25 percent). Third-party savings apps are not used much, with use in the low single digits for the grocery channel. 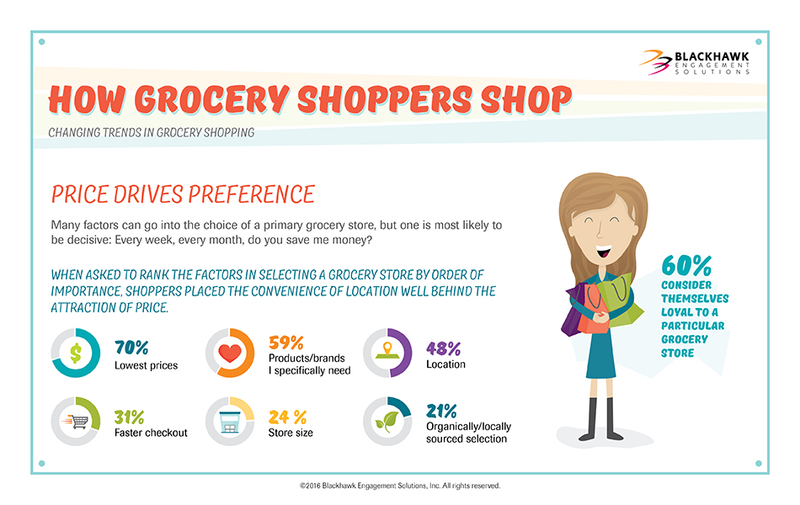 A full report exploring the findings of Blackhawk Engagement Solutions’ “How Grocery Shoppers Shop: Changing Trends in Grocery Shopping” research can be downloaded here. Blackhawk Engagement Solutions is a division of Blackhawk Network, which built its business on pioneering new products that shoppers love and widely adopt such as gift card malls in grocery stores. 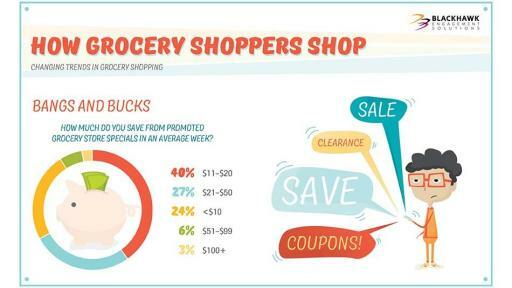 How Grocery Shoppers Shop: Changing Trends in Grocery Shopping is an Internet-based survey conducted by Blackhawk Engagement Solutions from September 1, 2015 to September 4, 2015. The sample size included 1,545 American respondents, ages 18+. The Shopping Apps Study is an Internet-based survey conducted by Blackhawk Engagement Solutions from October 26, 2015 to October 30, 2015. The sample size included 2,507 American respondents, ages 18+. Blackhawk Engagement Solutions is a leading global provider of customized incentive and engagement solutions for consumer promotions, employee rewards and recognition, and indirect sales channels. We are a strategic partner with many of the world's leading brands and a thought leader that provides game-changing engagement solutions. Through our products, services and innovative technology, we inspire actions that impact results. For more information, please visit: bhengagement.com.